My second grader has now completed one sleepover party as a guest and another as the hostess! 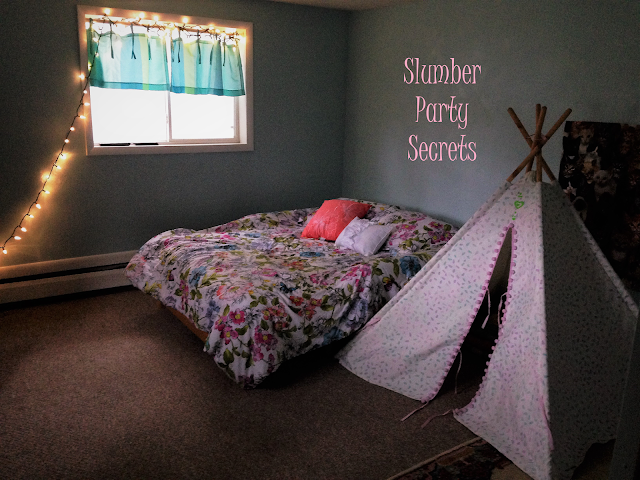 I don't usually do this, because I'm faking my way through life just like everyone else, but I feel so good about how happily both of these occasions went that I have compiled a list of tips for a successful slumber party, whether your child is a guest or a host. It is so wonderful to have a day of recovery after the party ends. For example, if the children will be spending Friday night to Saturday morning, don't plan to do anything but nap on Sunday. Try to invite guests who all know at least one other guest besides the host. If possible, choose a group that has something in common--all acquaintances from the same school or scout troop or church or neighborhood. Ensure that your home is a safe environment, and be prepared to discuss accident prevention, rules, and emergency plans with parents who may have concerns. (All parents will have concerns, of course, and some of them may ask questions! I'm one of them.) If you have pets, a swimming pool, weapons, a trampoline, or any other potential hazards, be prepared to lock them down responsibly or take other safety measures while you have young guests in the home. Let the birthday kid take the lead on choosing the theme, decorations, and toys/games/activities to have available. This empowers your child and will probably result in a more enjoyable night for the kids than anything we parents dream up on inspiration boards. If possible, offer two rooms where guests may choose to sleep: one for late-night partying and another for those who would like a quiet place to go to sleep before everyone else is done watching ninja cartoons and playing UNO. Distribute warm slipper-socks as guests arrive. Bonus points for matching sleep masks! Give each guest a brief tour of the house and an overview of ground rules. Offer a variety of healthy snacks like fresh fruits, nuts, and even veggies, as well as party favorites like pizza, mac and cheese, and popcorn. You don't want any hangry kids in the house, and many children are picky eaters (or have allergies or other dietary restrictions) at this age. Don't take it personally when you hear those "My dad makes this differently" or "My mom buys another brand" type of comments. Part of the value of sleepovers is letting kids process the reality that other people live differently, and this may be their first time experiencing the way you do things--or sleeping over at a friend's house at all. Have treats, of course (the cake and ice cream! ), but limit the amount of sugary and greasy foods to avoid stomachaches--or worse. Have plenty of non-sugary beverages available, like good old water, but maybe limit beverages a couple hours before bedtime. Do clean and tidy your home, but don't stress about your worn surfaces or scribbled-on walls. Children do not care about your home decor or whether your bathroom is updated. They'd rather have a comfortable space that isn't too precious to play in and get a bit messy. Discreetly cover the mattresses under the sheets in case of spills or accidents, if guests will be sleeping in a bed. Have extra toothbrushes and toothpaste on hand. Someone usually forgets. Avoid unsupervised use of online devices as much as possible with younger children. Some kids will come with their own phones and need access to them as a link to their parents. Set guidelines and check in frequently to make sure they aren't delving down one of those creepy YouTube holes. Check in once in a while to make sure everyone has their needs met, physically and emotionally, but try not to be intrusive. Sleepovers with minimal adult interference are great for peer bonding and developing decision-making strategies, social skills, and self-confidence. Kids will initiate group activities on their own: board and card games, video games, hide-and-seek, imaginative play with toys, watching movies, giving makeovers, singing songs, dancing, whispering and giggling about crushes. Talk to your child about the sleepover in a calm and happy tone. Share memories of sleepovers you enjoyed as a child so yours can imagine what to expect. If you don't seem worried, they'll be less likely to worry. Ask your child if they have any questions and how they feel. It's natural for a child to feel a little nervous about spending the night in an unfamiliar setting. Don't push them too hard if they aren't ready. Instead, see if they can go to the beginning of the party and go home in the evening. And if at all possible, be prepared for a change of heart either way on the night of the party. Please RSVP! But if you forget, still do contact the host at the last minute. In my opinion, it is so much better to receive late RSVPs than face the nightmare of nobody coming to the party. When you RSVP, ask any of those questions that will bother you not to know. Ask about guns and storage, about dogs, about pool safety and who else will be there. If the host bristles at such questions, that might be a red flag not to go through with sleeping over this time. A caring host will not take offense at any of your concerns and will perceive you as a responsible, conscientious parent. Don't stress about the perfect gift. Have your child pick out whatever goofy thing they think their friend will like, even if it's a plastic Ninja Turtle riding a flying dinosaur. (This was an actual gift my daughter chose once, and it was received with immense delight.) Spend less than $10 or just go ahead and regift something unopened, and always use an old gift bag or wrapping paper. Other people do it, and the birthday kid will love whatever is in there. That's been my experience year after year! Make sure your child brings: a phone number to get in touch with you at any time of day or night; comfortable jammies; a lovey if they still use one; and a plan and supplies for nighttime accidents if they might occur. These incidents don't have to be a big deal if the child feels confident about handling them. Tell the host about any food restrictions, allergies, medications, or health issues that may be important to know. Get ready to pick up an excited but sleep-deprived kid the next morning! After the high wears off, they'll need extra rest. Even second graders will try to stay up past midnight when given the chance. Sleepovers are a rite of passage that should be fun for everyone involved and help children to gain independence and social competence. It's true that they are a stress on parents, who are either hosting a herd of children all night long or worrying about them, but I think they're totally worth it!